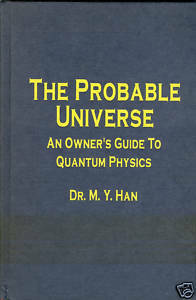 The Probable Universe: An Owner's Guide to Quantum Physics by M.Y. Han From Book News, Inc. Han (physics, Duke U.) explains in layman's terms the physical principles behind quantum mechanics, including photons, wave-particle duality, and the uncertainty principle. Product Details Hardcover: 146 pages Publisher: Tab Books; 1st ed edition 1st Printing (November 1, 1992) ISBN: 0830641912 First Edition, First Printing. Product Dimensions: 0.5 x 6.0 x 9.2 inches Shipping Weight: 12.0 ounces. Amazon has 8 copies: most are ex-lib or trade paperbacks; only 2 new: 84.99, 85.00. Good condition but bottom of spine on front has some scuffing from storage.